We have been in contact with a few people about building their big boys for them. If you have a puzzle you want assembled but know you dont have the time or patience, you can ship it to us and we will build it for you! Wait WHAT? Yup, you pay for shipping, we will build the puzzle and ship it back to you securely for final assembly and framing. We will blog about the progress and you can watch it take shape! 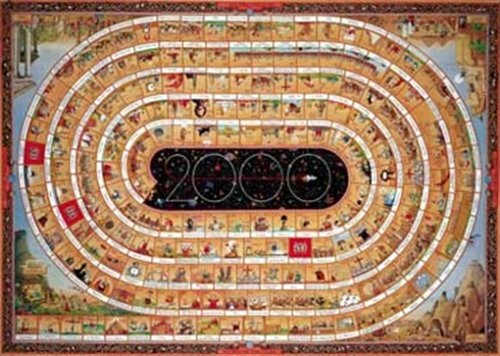 The first puzzle we are building is for Dawn, the Degano's 2000 Years of Man - 8000pc by Heye. The puzzle is on its way here, if you are interested in this service, please send me an email with the contact form on the right side of this website! Well, whats in it for us? Good question! We want to build every puzzle over 5000 pieces and well, we love doing it. We would like to be "paid" in puzzles for good service so if you send us a puzzle on our wish list, or any Big Boy we don't own, we will be eternally grateful! Our first puzzle building service project, Degano's 2000 Years of Man - 8000pc by Heye for Dawn!